I’ve read his blog for some time now. To say his posts are interesting or have a point of view, wouldn’t give them proper credit. Whether he and I are on the same wavelength for the various subjects he chooses to write about is peripheral. We definitely have a difference of opinion regarding where the album Abbey Road sits on Beatles’ history, but that’s besides the point. And, it’s that perspective, and his wordsmithing, that I keeps me coming back for more. Hey, I’m honored he has me on the blogroll — plus, all of this finally got me to read his book. I flit around a number of authors and genres in my audiobook/book readings, it’s in my nature. But, I do have a fine appreciation of history, which dominates my non-fiction selections. 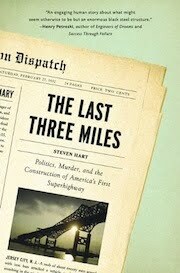 Steven’s The Last Three Miles: Politics, Murder, and the Construction of America’s First Superhighway turned out to be something exceptional. It details the impact (on all of us, in fact) of the building of the Pulaski Skyway in the state of New Jersey. How it came to be, in one of the most congested areas of the country, and how the politics of business, labor, and city hall (and one formidable mayor, Frank Hague) shaped it (and the automobile mess we’re in) are told through the insightful prism that is Mr. Hart’s narrative skill. The book had me enthralled from beginning to end. Even though I’ve only spent a total of two hours in the state of New Jersey (on a layover at Newark Liberty International Airport), I feel like I experienced a good deal more there after The Last Three Miles. Perhaps, I’ll make it back someday — maybe even to Steven Hart’s indy book store, Nighthawk Books. If so, thanks for the road trip, Steven. This a reprise of a short book review I wrote back in 2010. Now dedicated to author Steven Hart, a good friend who recently passed away to the shock of many. May he rest in peace. What a fine personal tribute Michael! If I may say, you have a way with words yourself. I love your poetic style. I completely agree with Ruth up there. A lovely tribute. How wonderful that you wrote this in his lifetime, so he could enjoy. He sounds a wonderful man in spite of his Abbey Road positioning. Agreed. Thank you very much, Paulette.